Hello again and happy Valentine's Day! Been a while, but the swatching mood hit me and I threw a post together. If you're a Sinful Colors fan, you've probably had your own picks from their SWAK collection since January. They came out weirdly early this year, along with the St. Patrick's Day display. I wore one of them as an accent about a month ago. So this post is...yeah...kinda late, but I did it and that's what counts. We'll call it practice for my actual comeback, right? Anyway, let's get this post rolling! Break Dance Not Hearts is a soft purple and silver foil. So glowy! So shiny! So purple! This is two coats. It gives a half-hearted try at brushstroking, but it's easy enough to prevent. My nails look kinda thick and lumpy, but it's not this polish's fault. I've switched to a hard gel base coat and I'm not great at it yet. Another reason we'll call this a practice post. You know I had to mattify it. The glow gets even stronger! Readie Or Not is a rich maroon and silver foil. Even glowier and shinier...but not as purple. I like it more than Break Dance, because it's vampier. It felt really familiar, and you'll see why if you sneak a peak at the next photo. This is two coats, but I only used one when I wore it as an accent. It depends on your application. Does it look more familiar when it's mattified? Looks like OPI Lincoln Park After Dark Suede, doesn't it? I should have done a comparison. I don't think they're complete dupes, but Readie might satisfy a moderate craving for that OPI. Kissful Thinking has little white matte glitter and red metallic lips in a clear base that's turning pink. As cute as their shaped glitters for holidays are, Sinful Colors needs to quit it with the bleeding red glitters already. These lips are going to be silver by next Valentine's Day, I can tell already. They're sparse enough to be "optional" though and they need fishing and placing. They also refuse to lay flat to the nail, so if you're C-curvy like I am, they're gonna stick out. 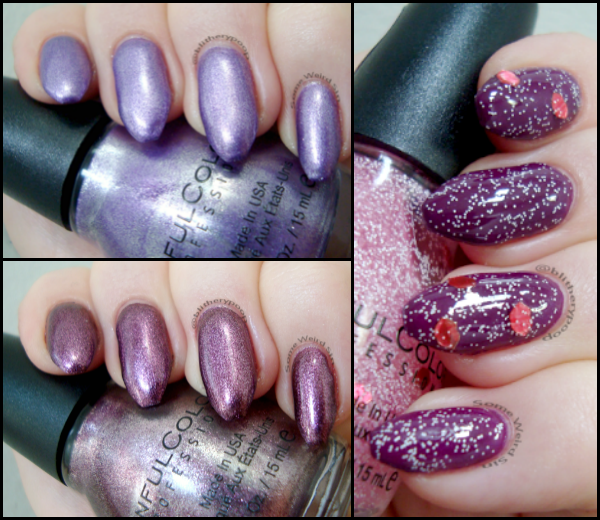 Still, the tiny white glitter has all kinds of layering potential and I'd say Kissful is worth it for that alone. Bottom line: Big yes to Readie Or Not. Smaller yes for Break Dance. Solid maybe for Kissful. Wow I feel rusty! I think I've forgotten how to do my hand pose. All of this feels slightly alien, but it's good to be even kinda maybe back. I've missed blogging so much! Things might be taking a turn for the better FINALLY, but we'll see. Some day I'll explain what's been going on. For now, have a lovely, lovey day with your beau/belle/friends and I'll see you sooner than later.